I survived my fourth Ohio State-Illinois Big Ten Men's Tennis Championship final, but the Illini did not as the Buckeyes claimed the crown. 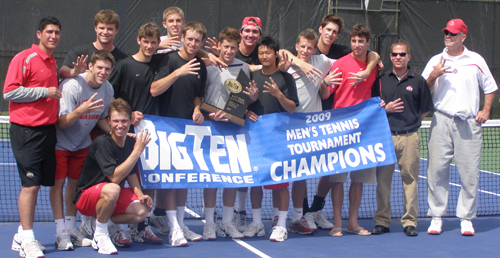 In 2005, the University of Illinois claimed their ninth Big Ten Men’s Championship, Ohio State who has taken the title ever since. Last year's battle came down to a tiebreaker in the final match of the day. 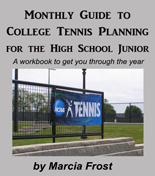 This year's event didn't have quite the drama, but offered three days of great college tennis at the University of Michigan. The weather was just beautiful (80 degrees and partly sunny) for my Friday arrival in Ann Arbor. While the top seeds cruised (Ohio State over Wisconsin; Illinois over Penn State -- both at 4-0), the others were not quite that simple. No. 4 Michigan and No. 5 Northwestern had a tight one that came down to a cramping Jason Jung (pictured below) after Michael Sroczynski's match point turned into a third set for Northwestern. In the end, the Wolverines got it 4-2. In a bit of an upset, No. 6 Indiana took out No. 3 Minnesota. It was a fairly quick match with a surprising 4-1 score, but it was well-earned by the Hoosiers, who took the doubles point and never looked back at their lower seeding. Saturday offered excitement as the host Wolverines pushed Ohio State a bit. After the top seeds took the doubles point, they continued to lead with quick first sets on five courts. Buckeyes Steven Moneke and Chase Buchanan brought their team just one point away from the finals, but Michigan came back on the remaining courts, heading into third sets. The No. 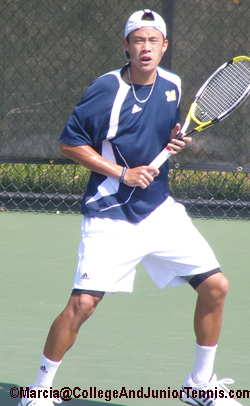 1 seeds proved they belonged there as they only dropped one -- (George Navas beat Balazs Novak), and walked away at 4-1. It was a very different semifinal for the Fighting Illini. The second-seeded team wasted no time getting a 5-0 victory over Indiana, clinched simultaneously by Dennis Nevolo and Marek Czerwinski. And we all had a moment of Déjà vu as we prepared for another Buckeyes-Illini showdown. The doubles point in the final went to the Fighting Illini with only the #3 team of Bryan Koniecko & Shuhei Uzawa winning for Ohio State. From there it was a different story as the Buckeyes seemed to command every match on the court. Their new freshman (he just joined the team in March) Chase Buchanan took the first point over Brian Livingston, 6-1,6-2, and then Justin Kronauge took out an ailing Roy Kalmanovich at 6-3,6-2. 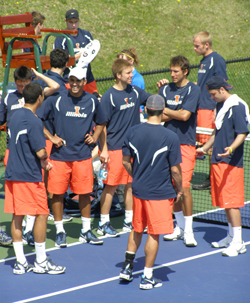 Ohio State was in the lead and, despite some comebacks by the Illini, they took that momentum to wins by Big Ten Player of the Year Bryan Koniecko and then a championship win by Balazs Novak (pictured right). This will most likely be the last meeting of these two rivals this year as they are in opposite sides of the NCAA Championships draw. So, unless they both make the final, I'll have to wait until next year for a Buckeye-Illini rematch. For more stories and photos from the Big Ten Men's Championships, visit College Tennis Examiner and Zoo Tennis.